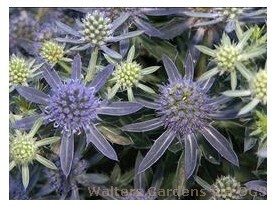 Product Information : The first genetically produced dwarf Eryngium, standing only 8-12in in bloom. Large, shimmering blue flowers stand at attention above a rosette of smooth, blue-green leaves. Long-lived, reliable perennial prized by florists.